With the Thanksgiving holiday a dark night in the NHL, let’s go through all the teams and have them give thanks for what they have. Anaheim – Despite all the injuries, goaltender John Gibson has been healthy this season and keeping the Ducks in games they shouldn’t be in. Arizona – The Coyotes are a force when shorthanded and didn’t get off to the 0-10-1 start that occurred last season. Boston – One of the best lines in hockey with Brad Marchand, David Pastrnak and Patrice Bergeron (when healthy). Buffalo – Getting the first pick in 2018 and grabbing a generational defenseman in Rasmus Dahlin. Calgary – Elias Lindholm has given Johnny Gaudreau and Sean Monahan the third member of the line to be elite. Carolina – That Sebastian Aho lasted until the 35th pick of the 2015 Draft. Could be the best draft year ever, possibly better than 1979. Chicago – Corey Crawford is back and healthy after missing the last half of last season and the start of this one with a concussion. Colorado – The best line in hockey with Nathan MacKinnon, Mikko Rantanen and Gabriel Landeskog. Columbus – The return to form of Cam Atkinson who had 35 goals two seasons ago and is on pace for 52 this season. Dallas – The return to health of Alexander Radulov who has been a beast with 16 points in 12 games. Detroit – Youngsters Dennis Cholowski and Michael Rasmussen. The future is getting brighter in the Motor City. 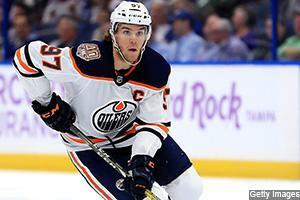 Edmonton – Connor McDavid. Enough said. Florida – Getting the highly-controversial Mike Hoffman from Ottawa via San Jose. He has a 17-game scoring streak and has given the Panthers two very good lines. Los Angeles – That the NHL is not the English Premiership. Otherwise they could be relegated to the AHL next season. Minnesota – The return to glory of Mikko Koivu as well as the offensive scoring of Matt Dumba who has 10 goals in only 22 games. Montreal – Max Domi. It was thought that the Canadiens were ripped off when they gave up Alex Galchenyuk for Domi. With 26 points in 22 games, they surely didn’t. Nashville – The best set of blueliners in the NHL. P.K. Subban, Roman Josi, Ryan Ellis and Mattias Ekholm are a superb top-four. New Jersey – That Pavel Zacha may finally be turning things around. The sixth overall pick in the special 2015 class had nothing in his first 12 games but has four goals in his last three games. New York Islanders – They had an outstanding draft in 2018 in that Oliver Wahlstrom and Noah Dobson fell to them. They are two big pieces in the re-build. New York Rangers – The trade with the Bruins which netted them K’Andre Miller, Ryan Spooner, Matt Belesky and Ryan Lindgren for 11 regular season games and 12 playoff games of Rick Nash. They flipped Spooner for Ryan Strome, making the trade look even better. Ottawa – Thomas Chabot is making everyone forget about Erik Karlsson. Philadelphia – Carter Hart will solve their goaltending problems in the years to come. Pittsburgh – Sidney Crosby is back after missing three games and Kris Letang and is back to being an elite offensive defenseman. St. Louis – That they received Ryan O’Reilly from the Sabres in the off-season. Otherwise the Kings comment would apply to them as well. San Jose – It was thought the Erik Karlsson deal would be it but the emergence of Timo Meier as a star is the reason to be thankful. Tampa Bay – Brayden Point has been a stud this season as the Lightning are a top-three team in the NHL. Toronto – Morgan Rielly has turned into the number one defenseman that they have needed for years. The signing of John Tavares has been great as well. Vancouver – Elias Pettersson is the most exciting rookie in the NHL and gives Canuck fans plenty of hope for their future. Vegas – Their run of last season from expansion team to Stanley Cup Finalist was the sports Cinderella story of the century. The return of Nate Schmidt from suspension is one of the few good things this season. Washington – That they are the defending Stanley Cup champions. It has a nice ring to it. Winnipeg – Sophomore Kyle Connor plays well no matter who his linemates are. Patrik Laine is a stud on the power play. Hope everyone had a great Thanksgiving!!! !